Bringing a new horse into your fold can be intimidating for you and the horse, but you can quickly ease his fears and become acquainted with his needs and personality. Treat him gently and give him plenty of time to acclimatize to his new situation before taking him out for a ride. Even gentle horses can become agitated when they meet a new owner and move to a new home. Ask the previous owners whether the horse seemed more comfortable in the barn or outside in a pasture or paddock. Make slow, easy movements when handling a new horse so you don't spook him, and keep your hands away from his face and tail for the first couple of days. Put him in a stall, if that's his preference, or into a paddock for at least a few hours while he gets used to the new sights and smells, but don't stay in there with him; let him explore while you're close by, but give him a little while to calm down before you handle him. When he's calm enough to handle, lead your new horse around his home. Let him get your scent as you give him fresh food and water, either in his stall or outside. Lead him to the food and let him eat if he will, then walk him around the barn or the outer edges of the paddock. If you have other horses, let him sniff them over the fence during your tour. Walking him on a lead helps you learn more about his mannerisms and training while he becomes familiar with your scent. 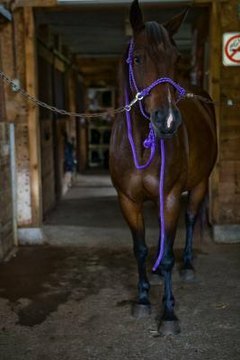 If he's a horse that likes to be in his stall, bring him out for several short walks, returning him to his safety zone and his food for a break between each jaunt. Most horses enjoy being brushed, and this gives you a chance to become acquainted with him while helping him relax. Tie him to a post outside or at the inside edge of your barn, facing out, so he can look around his new home while you groom him. Keep the grooming simple, using basic brushes for his body. Start with his back and sides, then move onto his neck. Don't rush into petting his head; horses tend to be skittish about their eyes and mouths, but try scratching his ears or under his jaw when the horse seems relaxed, such as when his head rests slightly higher than his chest -- rather than with his neck extended -- when his ears are still and his tail is low. If he throws his head back when you reach for him, wait and try again later. Brush his tail later. If you stand behind him before he trusts you, he might kick out of fear. Also, avoid spraying him with water or fly spray, and don't try to clean his hooves the first day. These can spook horses who don't quite know you yet. You shouldn't try to ride your new horse for the first couple of days, but you can get an idea of how well he'll behave. Holding him on a long lead with a coiled rope in one hand helps you move him in a circle and test his training. Turn with him as he moves around the circle near the end of the lead, and pull gently on the lead to see if he'll move in closer. Wave the coiled rope to speed him up, or touch his side with the rope if he's close enough. Repeating this for the first couple of days helps you learn his level of training while he gets a feel for your commands. When you're ready to gear him up for riding, let him smell everything before you put it on him, including the bridle and saddle pad. Giving him plenty of treats as you put on the tack can make him more comfortable, as can walking him around while he's wearing his saddle before you climb on. Sticking to your pasture or yard for the first ride is best, giving you both an opportunity to learn each other's style before taking the ride away from home.